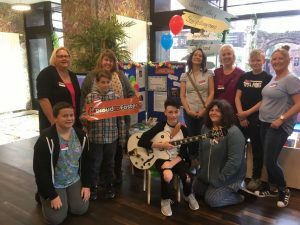 During the Fostering Network’s sons and daughters month celebrations, sons and daughters and their parents were invited to support a recruitment events at the new Storyhouse in Chester to raise awareness of the need for more foster carers. This was also an opportunity for Cheshire West & Chester Council to thank the sons and daughters of foster carers for the support and friendship they offer within their foster family. During the morning, members of the public could talk to foster carers and their sons and daughters about fostering alongside raising your own family. There were crafts and balloons for children and information packs to take away. One of the regular members of the sons and daughters’ group Josh entertained everyone by singing and playing his guitar which was a real treat! Dee Radio & Chester the Cat also came along to support us by tweeting about the event. Members of the sons and daughters group were treated to a cinema performance in the afternoon with goody bags and those that had helped with the recruitment event were given complimentary theatre tickets to watch a Christmas production of the Secret Seven as a thank you. If you have ever considered fostering alongside raising your own family, why not get in touch and find out about how we can support your own children too.